In the SaaS world, when it comes to improving your business and reducing churn it’s easy to talk about the fun stuff like onboarding customers. Yet, not enough conversation goes into the not-so-fun things like cancellation experiences. A customer cancelling your product is a big deal and a great opportunity to learn more about the user experience. To provide some context on why a cancel experience is such a big deal, let’s look at what’s actually happening. You convince a customer to give you their credit card information (a gateway to revenue for your business) and then you let them down or they lose sight of the value in your product. A cancel experience is an opportunity for your organization to adjust and grow. Lindsay Bayuk of Pure Chat gave us some actionable insight into the cancel experience at our 2015 SaaSFest event. In case you missed the talk, we want to share with you those nuggets of knowledge. By the end of this post, you can expect to learn: why cancellations are important, how to communicate value to your customer, and build a retention process to minimize churn. A customer cancelling your service is a huge event for a few key reasons. It indicates that something in your product or messaging is lacking and the customer no longer sees the value in your service. This is tremendously important to your business because a purposefully designed cancellation experience is an opportunity for you to re-engage the customer, discover the issue with your product or service, and then find a solution. At Price Intelligently, we’ve written posts before on how a customer hasn’t churned when they cancel. Lindsay shared experiences and gave advice to support this same concept. When you see a user leaving your product, it’s an opportunity for you to take action and figure out why they are on the verge of churning. Lindsay started with asking these questions: What is the story that you're telling users? Is your product easy to navigate and user friendly? What is the source of this user's frustration? These types of questions are what you want to be thinking about as you design a solution to prevent customers from jumping ship. "Don't bury your cancel button - build a solution process to minimize churn"
Lindsay suggests mapping out the cancel experience and going through it from the customer's point of view. Taking this action will allow you to really see what the user experience is like while bringing to light any potential gaps in communication that may be present. The key here is to figure out the frustration points of your company's cancel process. Everyone has had a bad experience with trying to cancel a SaaS product. Situations where the cancel button is hidden beneath layers and layers of different pages within a site are extremely frustrating. These types of cancel-workflows are a hard experience to forget about once it happens. So, you don’t want to become the company that's hiding the exit button. Instead, a better approach is to make the pathway easier for the customer while at the same time presenting useful and actionable options for re-engagement. Lindsay shared the screenshot below of how her team has designed their cancellation experience and it's clear they are taking the time to do exactly what Lindsay encouraged us to do. Before a user churns, there's an opportunity for Pure Chat to re-engage with customers, offer them solutions to any problems they were experiencing, and to learn more about why they no longer see value in the product. Don’t build a cancel process, build a retention process. Center your entire customer experience around providing real value. 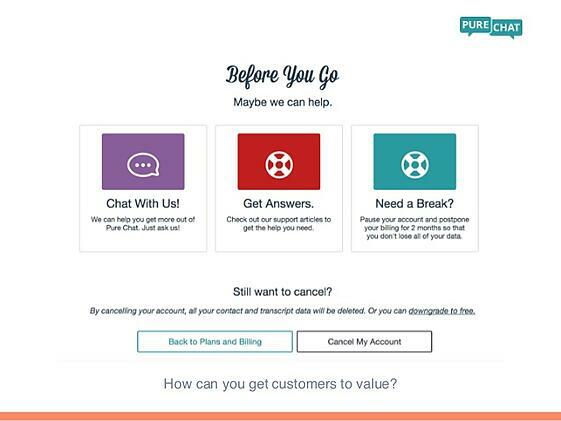 At Pure Chat, they redesigned the cancellation process after figuring out that it wasn’t centered around value originally. As a design change, Lindsay and Pure Chat now present users who want to cancel with three beneficial options that create value for them. These value points are: Chat with us, Get answers, Need a break? They aren't just any ordinary statements; they acknowledged actual pain points that Pure Chat's users may have. Think about it like this. When you were young and you scraped your knee, your mother greeted you with a bandaid and a smile. She didn’t hide the bandages in a cabinet that you couldn’t reach so that you couldn’t get to them. Well, your users are coming to you with a scraped knee if they are looking to cancel your product. If you present them with that solution and smile, they're most likely going to be happy about it and less likely to leave you. Cut out the gaps in your messaging and create a clear path to value for the user. Most of the time, customers leave a product due to confusion or some sort of lack of understanding. Typically, these shortcomings can be addressed and redirected in a positive way. 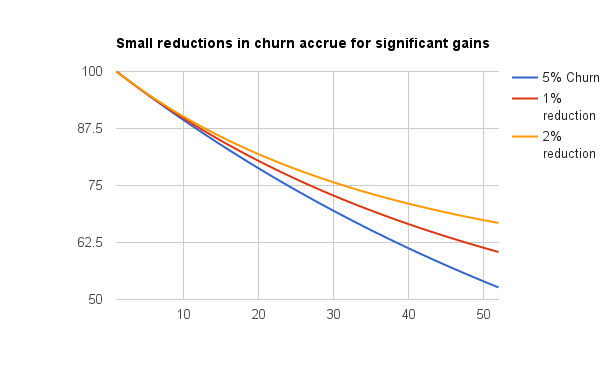 Just like anything else in your SaaS business, minimizing churn is a process. Ask questions, figure out where your customers' pain points are, and create the solution. Remember, a user gives you their credit card information at the start. That means they want to be there and use your product. If you keep customer value at the core of your approach, you are equipped to combat churn and increase retention. At the end of the day, value is what matters to the user so keep the value in plain sight.